Not just Careers, but Virtues. The game of cricket will be left poorer when the curtains are drawn on the Year 2012. It isn’t as much about the retirement of four of cricket’s greatest servants, as it is about the virtues they possessed. Great sportsmen have seldom been vehement about how they want to retire. “I want to retire on a high,” some would say, with more than a hint of melodrama. Some retire placidly, with poise. Some are shown the door, mercilessly, in cultures where empathy ceases to exist. And some are slowly nudged towards the questions of their futures, with hope that the message is conveyed. Towards the twilight of their careers, champions often find themselves living in a profoundly different world populated by fans-turned-critics, journalists with poison-laden ink pens and ‘advisors’ of a truculent variety. Insinuations fester while every act on the field is observed under a microscope, scrutinized and mock-obituaries written. After all, recent statistics will remain the principal standard by which players are judged. In countries like India, where resources (in other words, talented players) aren’t limited, the question that lingers around asks if it is worth investing (again) in a successful past over a hopeful future. It has happened in sport – some even come out of retirement because they ‘miss’ the sport too much (I’m not talking about Pakistani cricketers here). They miss the competitiveness, the adhesion. Paul Scholes, for one, went out on a high and was welcomed back with open arms when he decided to return to Old Trafford. I doubt if anyone from the Premier League can pass the ball with the pin-point accuracy that he possesses at his age. Michael Schumacher’s tale, on the other hand, paints a different picture. To say that his return was underwhelming isn’t harsh, although it wasn’t, in theory, a disaster. On the other hand, when champions begin to get a sense of feel that they are the brick wall between a young talent and a regular place in the starting XI, the sensible ones make wise decisions. Cricketers continue to ply their trade in T20 leagues, and footballers move to the MLS or, in some cases, Australia. There is a sense that the advent of T20 cricket has caused a certain lassitude, that all is not over if one’s curtains in the international setup is closed. But this can’t be taken on face value. Yes, solace can be gained from the fact that we’d still witness a Laxman or Dravid in IPL colors. Or a Tendulkar, more crucially, in whites. But when you start saving up for the things that money can’t buy, the memories that remain linger around long enough to make you miss it. And you end up waiting for the right antidote – in Dravid’s case, the emergence of Pujara (as premature as it may sound) acts as a safety net, while Kohli’s ODI exploits provide a layer of comfort given Tendulkar’s absence henceforth. In some cases, the void may never be filled – the pace department, for example. Or to an extent, even spin. West Indies, and more recently, Australian cricket have found it a challenge to fill voids vacated by legends. Transition is never easy – some plan for it in advance, some realize it the day the inevitable strikes. You could extend this to beyond sport. Narayanamurthy’s exit from Infosys created a cataclysm what today is known as – well, still Infosys, but with an uncertain management structure and vision. Hewlett Packard isn’t the same ever since Mark Hurd was shown the door. Oracle was the beneficiary. And Larry Ellison never misses out an opportunity to laugh at those who’d sent him an early Christmas card. After all, a player is most missed when, in his or her career, he or she had done something that had, or likely would have, a long-term effect on the sport he or she played. Jonty Rhodes revolutionized the art of fielding. David Beckham show-cased what could be done with a dead ball on a football field. Usain Bolt demonstrated that there’s more to two legs than we’d have ever imagined possible. And so on. And when 2012 comes to a close, cricket fans will remember four men who’d continue to remain as the epitome of four different virtues: Dravid for his patience, Laxman for his sublimity, Ponting for his grit and Tendulkar for carrying the burden of a billion hopes. A common virtue, one that is easily forgotten, relates to their deterrent attitudes towards the media prior to their retirements. Although most of us got the feeling that media pressure undid them, in truth, it didn’t. It is a virtue that took them through their highs and lows during their illustrated careers – to defeat the pens with their bats when it counted most. And to retire with a sense of pride with the focus on having represented their country meaning a lot more than any of the statistics that glorifies their careers. Cricket may never get an opportunity, in the near future, to witness these virtues given how the game has changed dramatically over the last decade. Inventiveness is the new buzz-word, with batsmen attempting physics-defying shots against the poor bowlers of the modern era. And who knows what the future holds? Not many back in the early part of the 1900s, during the Industrial Revolution, would’ve perceived the Mobile Revolution of the 21st century. But amidst all changes that happen, we will continue to remember what the four have done for cricket. Garfield Sobers is still spoken of today as the greatest all-rounder to have graced the game. Those who’d had the privilege of watching him play are never short of words when asked about his feats. And as four legends walk away from the sport, so will we when asked about these greats in the future. Sachin Tendulkar’s retirement from ODI’s did not come as a surprise to me. After all, he has not been an active ODI player for quite some time now. But when I sit down and think about what we he achieved, my eyes fill with tears of pride. He has so made the format his own that now it’s possible to think if ODI’s itself is going to retire with him. In a country that is obsessed with statistics more than performance, results more than playing a good game and individual performances celebrated above the team, he gave us reasons to do both.Talk about numbers while still amazed by the beauty of his batting, celebrate a victory while watching him talk about respecting his opponents and most of all, celebrate a Tendulkar century along with an Indian win. We explored the statistics to understand his genius. We read articles to understand his brilliance. In short, Sachin Tendulkar made an average Indian fan, better. It is a monstrous task to compile ten of his best from a collection of over 18000 runs and 49 centuries over 400 matches. I am sure a lot of you would disagree with my list, thinking how did I miss this, how can I miss that types. The list that I have put down here are the ones that simply sprout out of my mind when I saw the news of his retirement from ODI’s. No research and no thinking over. The Sachin Tendulkar fan in me came up with it. I had combined a few performances in one, in a logical way to make room for others. It’s Sachin, how can I not? 10. He blasted 41 runs off 26 balls against Pakistan in the 3rd finals of Coca-Cola Silver Jubilee Independence Cup, a rollicking start (the score was 71 in 8.1 overs when he got out) that ensured India would chase down Pakistan’s 314 in near darknesss. Saurav Ganguly with 124, Robin Singh with 82 and Kanithkar’s invaluable 11 not out gave India the win with a ball to spare. 9. He was playing all sorts of role in the team when one day Sidhu woke up with a stiff neck in New Zealand and Azharuddin walked up to him and asked if he could open the batting. That offer changed the face of ODI’s forever. He blasted 82 off 49 against New Zealand and a superstar was born. 8. The great man has just lost his father and had to fly midway during the ’99 World Cup to perform the last duties. Most thought that his tournament was over, but the master came back and how! It may be against Kenya but his 140 not out in the match after his father’s passing was as important as any of his other. It showed how much he cared for his country. And he looked up at the skies as he got to a hundred, a sight that was to become commonplace on his getting to that landmark thereafter. 7. He was in indifferent form going into the final of the CB series in 2008 against Australia. But he took the grand finale by a calculated storm that did not decimate the Aussies, but rather destroyed them steadily. The Aussies might have had a stronger chance of getting him out if he was in marauding form. But instead, he chose to play the Anchorman, piling on runs at a fair clip and guiding an inexperienced batting to the finish. Both the century in the first final and the 91 in the second was a master-class. 6. 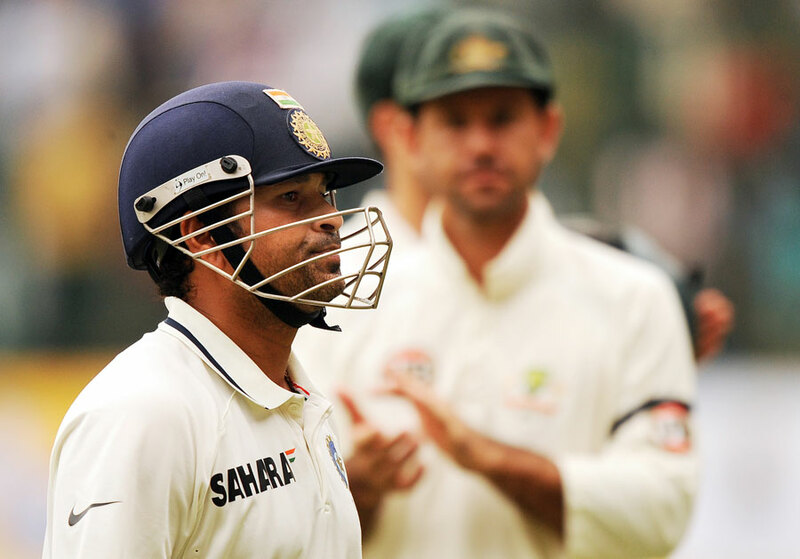 It may be India’s most embarrassing defeats, a forfeit, but still it was characterized as before and after Sachin. He made 65 out of the 125-8 that India managed in the world cup semifinal in ’96 before the hostile crowd at Eden Gardens stopped the match. It seems like the pitch had two layers, one for Sachin and the other for the rest of the batsmen. Such was the gulf in class. 5. For all the great batting performances of the little genius, there is one over that showed how cool his temperament really is. That final over in the hero cup semifinal when he successfully defended 6 runs against SA is one of my earliest images of him, one that made me a worshipper of him. How can a top order batsman bowl a nerve wracking final over and win the match for India from a seemingly hopeless situation. I was very young and believed only god can do miracles. I wasn’t wrong. 4. It was a princess that waited for the right prince to come and conquer her. Saeed Anwar and Charles Coventry came within sniffing distance of her. Sehwag was thought to be the man to marry it. But eventually, ODI’s first double century was captured by the king of them all against an attack that had Steyn, Morkel and Ntini, a handful on any track. It was an innings of textbook perfection and clinical precision. Sehwag eventually bettered it. But this is first love. Need I say more? 3. This happened a few weeks before the 200. But fans were transported to decade before when Sachin single handedly won matches for India. Set a demanding 350 to win, he scored exactly half the runs and when he got out, so did India, just like the old times. But that 175 was so breathtaking that even left the Aussies dazzled. 2. Perhaps no other team challenged Australia like how Saurav’s boys did in the last decade and perhaps no other player dominated them like how Sachin did in the decade before that. The 2 sandstorms that decimated Aussies in Sharjah ’98 is part of cricketing folklore now. You may find this an exaggeration but to me, those 2 innings made him a legend of ODI’s. 1. For all the centuries and a double century, this is the innings that still gives me the goose bumps when I think about it. How did he do all that? Playing Pakistan in pressure, more so if it’s in a World cup, and even more if playing for the first time in years. This was no stage for mortals or good players. The stage was set for only one man and how well he played. That 98 in the 2003 World cup is my pick for the best innings by Sachin Tendulkar in 23years. One shot stood out. A back foot cover drive off Wasim Akram still leaves me speechless, even after watching it hundreds of times. He defined the format, pulled the crowds to it and single handedly changed, not just of India’s fortunes, but the future of the game itself. And we all grew up with him. We were school kids when Sachin was decimating attacks in the 90’s singlehandedly, so he was the superstar. When we went to college in the 2000’s a certain Mr. Ganguly so dynamically changed Indian Cricket that Tendulkar went from one and only superstar to the greatest batsman of the golden quartet. As we understood the game better, he became a legend. Farewell Sachin Tendulkar, albeit from colored clothing. We hope to see plenty of you in the whites, playing that breath taking straight drive, that audacious upper cut, that finest of leg glances or that ever so wonderful back foot cover drive. As a God, please inform the other one that created you that we said Thanks. We can say that we grew up and lived in the same time as the God of Cricket. Who else can? Finally that moment came, thanks to media, thanks to critics. Thanks for not giving us a chance to watch him bat for the last time. What Mayans predicated became true, finally something happened which came as a shocker. A person who played 463 matches, served country for 23 years, scored 18,426 runs with an average of 45, went out the way of someone who may have been just your average cricketer let alone a remarkable one as he. Is this what we wanted? I agree that he is not among the runs. But doesn’t he deserve a grand exit in front of 30,000 spectators, hooting ‘Sachin… Sachin…’ ? I think he deserved better. A person who got standing ovation every time, wherever he traveled, announced his retirement sitting at home, without playing a match, just before selection committee meeting, on the eve of the series against arch-rivals Pakistan and he said, “I call it a day”. As is their wont the media speculated what happened behind the scenes that perhaps forced this decision on Sachin. Many raised their eyebrows, so do I.
Whoever has put efforts in making this happen, did not do right thing. Any soldier would have loved to go and fight for the last time before quitting the service. Sachin is no less than a soldier for us and he would have definitely wanted to play the one dayers against Pakistan, against whom he made his debut at Gujranwala (Pakistan) in 1989 at the age of 16. He deserved to go out like that. But it didn’t happen. Very easily we Indians forget the past. We are used to saying things like “ salute to only rising sun”. I would like to tell something to critics that it’s not your fault, it is because you are born in India. You have achieved what you want, I hope you are happy now. Now you got all four greats of Indian cricket: Ganguly, Laxman, Dravid and finally the little big man Sachin. Now target next senior person, i.e. Sehwag, after that Yuvraj etc. If you don’t want senior players and if you don’t respect them, then why you allow them to be a senior. Fire them before they become seniors. Play your Under-19 side as the national team. That would make you happy. Like billion fans, for me too it is very hard to digest the fact that he won’t be wearing blue jersey anymore. I started playing cricket by watching him play like every other cricketer in this modern era did. I remember after watching him bat on TV next day I would to try same shots over the bowler’s head with straight bat. I never felt like watching a match once he got out (Indians who grew up in the 90s would know that). And that’s because I love his batting more than anyone else’s. He is a complete batsman. I always liked the way he carried his celebrity status, very humble. I admire him as a person more than as a batsman. 1. The one against Australia in 1998 Sharjah (143), I still remember those sixes which he hit against Australian pace bowling and treated them like local bowlers. He was like a man possessed, in a zone.It was the most brilliant and destructive knock I have ever seen from Sachin. Sheer dominance by a great batsman against world number one side. Fleming will be wondering about how this guy danced down the track and hit him over long-on and long-off repeatedly, because no fast bowler in the world like batsman hitting them straight sixes. He took India in the finals of Coca-Cola cup, single handedly. 2.For me, second best is 134 against Australia in same Coca-Cola cup finals at Sharjah where he hammered all Aussie bowlers. He unleashed some of his breathtaking strokes and power. I still remember, I was in Mumbai on that day. After depositing Aussie pace-man Michael Kasprowicz on the roof of Sharjah stadium Tony Greg said “This man is nearest to Bradman there’s ever been.” I don’t remember exact line, but he put Sachin in the the league of cricket greats when he was yet to score his 30th century. Now he is on the Everest of 100 centuries. 3. Third best for me is 98 against Pakistan in 2003 world cup while chasing a target of 274. I still remember that six which he hit off Shoaib’s bowling over third-man. That six was adjudged as “best shot of the tournament”. Salute the great man, the legend. Thanks for the entertainment which you did for for two decades. But GOD for God’s sake, please, please, don’t leave Test cricket like this. Kaustubh is a Software Engineer based out of Bangalore. He captains his club side CECC on weekends.